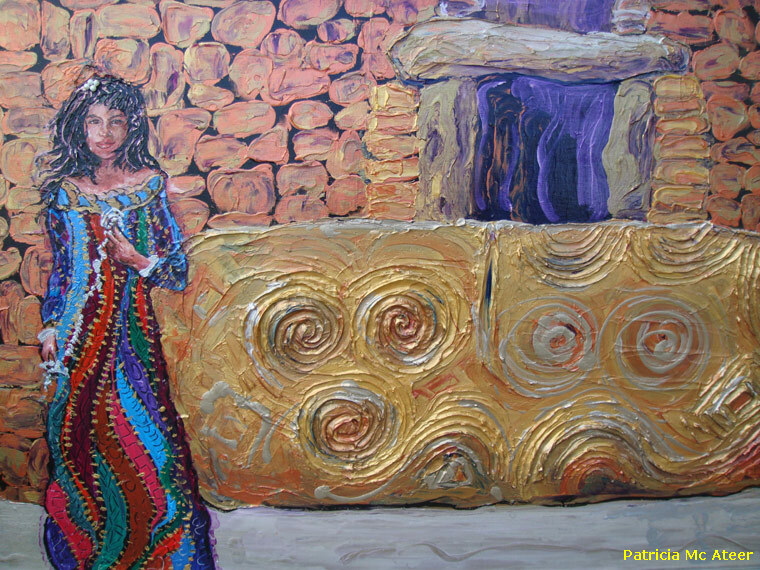 An Exhibition of paintings by Patricia Mc Ateer at the Brú Na Bóinne Visitor Centre, Donore, Co. Meath. The exhibition opens on Thursday 9th April 2009 from 7.00-9.30p.m. and continues until 30th April 2009. Patricia is from Dundalk and is now living in Omeath, overlooking Carlingford Lough, Co. Louth. Her work is mainly Celtic, the tagline on her brochure is Irish Celtic Mythology, Legends, Dolmens and more. This exhibition focuses mostly on Newgrange, Knowth and Loughcrew. Her work is contemporary visual in acrylic and mixed media and her use of colour is essential, not only in the paintings but because colour, movement and light remind her that legends and mythology in different countries lay the foundation for cultures very different from us and yet at the same time very similar to us on some inner level. In this body of work she is presenting in some of the pieces her new use of semi-precious stones and textures. Also by grinding up quartz and adding it to the textures of the work she believes that she is lifting the surface of the painting out rather than have a flat surface. The quartz is appropriate in these pieces as it is also used as a covering on the Newgrange mound. Acrylic, Mixed media texture, Semi-precious stones, Powdered and ground semi-precious stones. Danú, Earth Mother Goddess of the Tuatha de Danann. 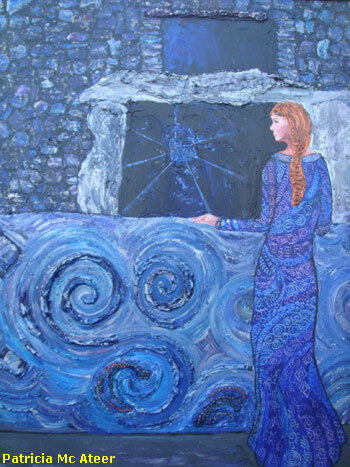 In the painting above Danú is at the entrance stone of Newgrange Mound. See how her hand joins the inside to the outside worlds. In the painting, the spirals resemble solar systems and galaxies, the artist is tying to show worlds both colliding and colluding as the Tuatha according to ancient legend originally resided inside these sacred mounds. The quartz on the front stones and amethyst on the silver from Achill Island copy the quartz currently decorating the mound. Blue quartz is crushed and mixed onto the entrance stone. Spiral semiprecious stones include goldstone, black pearl, malachite and garnet from India, Labradorite from Russia. Labradorite and crushed goldstone decorate her hair. 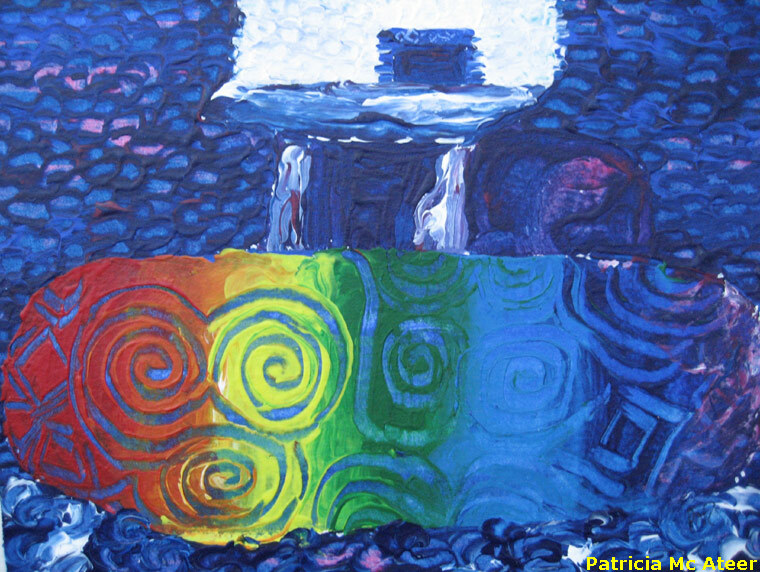 Rainbow Entrance Stone by Patricia Mc Ateer - Acrylic on heavyweight paper. The Rainbow Entrance Stone painting shows the Newgrange entrance stone, passage and roof box lintel. By using a rainbow underlay on the entrance stone shows the energy the stone holds and emits.